(Above) Panorama from Peak 7219. 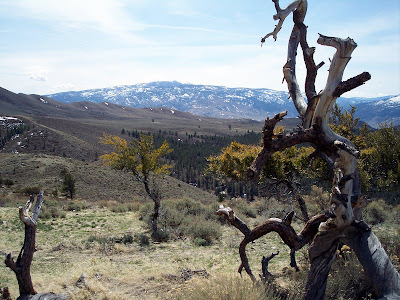 We car-camped overnight and spent Sunday exploring this isolated area west of Peavine Peak and east of Dog Valley. From a campsite on NFS road 134A, we hiked part cross-country and part on roads up to Peak 7219 (same destination as last year starting from the Copperfield trailhead). Great view of the Sierras from this high vantage point. Also hunted down a geocache near the peak. Returned via Meadow Valley (where we originally intended to camp, but were thwarted by a creek crossing we judged to be impassable–by wimps like us without skid plates), and then NFS road 192 which is on the USFS topo maps but is now mostly non-existent. Saw five deer, two rufous-sided towhees, a herring gull, some hawks, and several ATVs and dirtbikes. This is a great area, and it was nice to be out on a warm if windy weekend before the snow returned this week. What a great place! Trailhead camp directions: Take Bordertown exit from U.S. 395 at the California/Nevada state line. The access road on the west side of the highway heads north, then turns back south across the railroad tracks to Long Valley Road. Follow Long Valley Road about 4 miles to the Forest Service border signs, turn left at the junction and go about 1.5 miles to a 4-way intersection. Turn left onto NFS road 034A, which dead ends at a creek in about a quarter mile. (Coordinates on Geolocator below). This is a well-used campsite; it required a lot of cleanup to make it comfortable, but was a nice place despite that. Brought home a big garbage bag full of shotgun shells, broken glass, and practice targets of various ilks. It’s not really a trailhead either, but crossing the creek led east through the forest to an open area that was easy to traverse cross-country until reaching roads.